The most meaningful takeaway from my internship would have to be the personal growth I have witnessed in myself, particularly in the area of flexibility. My internship taught me that it is essential to be able respond appropriately, quickly, and professionally to unexpected technical errors, unplanned events, or last minute changes. I now recognize that there is great value in remaining open to potential solutions or ideas as they arise rather than always following a rigid set of rules or instructions. I was most surprised about the openness and honesty in the workplace. My internship was the first opportunity I had to be a part of an office environment. I expected coworkers to be kind but reserved with one another. I found quite the opposite. Everyone spoke truthfully to one another and expressed their opinions about strengths and future improvements for broadcasts in a professional manner. They were all deeply invested in producing the highest quality show possible and were not afraid to speak frankly about their concerns. It was a privilege to be a part of a team with such a cohesive dynamic. When I am a part of future organizations, groups, or workplaces, I would like to emulate this unique quality as much as possible. My internship has given me valuable technical skills that will help me in my future career. By working on live news broadcasts, I learned how to use professional equipment that I will likely encounter again such as studio cameras, audio equipment, and TelePrompTer. 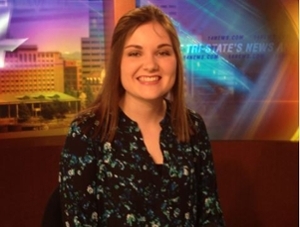 Prior to my internship, I had no previous exposure but in my time with 14 News, I received hands-on experience with the equipment. My internship has given me confidence in knowing that I could enter a similar professional situation and perform well. For any student beginning an internship, I recommend a couple of tips. First, know as much as you can about the company before your first day. Spend some time exploring their website, familiarizing yourself with their most recent initiatives, or become aware of their staff if possible. Not only will this show initiative on your part, but it will also allow you to contribute more to the work environment. Second, remember that your actions are a reflection of yourself. You never know where this position might take you. It could be a gateway to your career. Always be focused when you are at work and give your best on tasks and in group work. Finally, speak up. Don't feel intimidated because you are the intern. The company likely brought you on not only so you could contribute to their goals and projects, but also to teach you about the industry you are looking to enter. It can be nerve-racking to ask that first question, but you will be a better student and future employee for it.